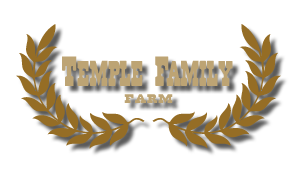 Temple Family Farm is a small farm tucked away in the middle of amish country in western Pennsylvania. We are 4th generation farmers, farming here since 1925. We believe in sustaining the family farm and providing people with a good quality product. Our customers can be proud to support family farming, choosing healthy products and meat raised on pasture in a humane, natural environment. Why choose a family farm over factory raised? Many smaller family farms have gone out of business due to factory farms. Factory farms are actually large industrial facilities where unnaturally large numbers of animals are confined closely together for higher production in less space. This increases the health risk to the animals as it is a breeding ground for bacteria. To combat this issue they are often given low doses of antibiotics on a regular basis to minimize sickness and disease. They are also frequently given hormone supplements to speed up growth and minimize time. We do not use hormones to speed up production or antibiotics as routine prevention. Our animals spend most or all of their lives in a natural, stress free environment on a large area of pasture.